Here are nine guidelines to help you write a better Executive Summary for your next business proposal. The Executive Summary creates difficulties for many proposal writers. Is it part of the business proposal or is it a separate document? How long should it be? Should it include costs? If you’re new to proposal writing, it’s easy to confuse the Executive Summary and the Introduction. After all, both seem to be doing the same thing. And they are, to a degree. However, the Executive Summary is really the ‘elevator pitch’ for your Business Proposal. If we see it in these terms, then we need to change the tone, structure and ‘hooks’ to capture the reader’s attention. One way to write the Executive Summary is to think of it as a standalone document. In other words, if you took it out of the Business Proposal… it would still make sense to the reader. When you look at it like this, you realize that you don’t need to write it before the proposal is finished. Instead, you can set it aside and develop it after you’ve completed the rest of the bid. Themes are an interesting way to develop the Executive Summary. What this means is that you choose a theme, for example, reputation, and then develop the bid around this theme. It adds a human element to your proposal. Instead of responding only to the requirements, you go deeper and explore the underlying pain points and needs of the customer. This makes the document much more interesting to read as it speaks to the reader on an emotional level. In this section, try to connect with the deeper underlying issues. For example, why does the client need a content management system? Do they feel threatened or risk getting left behind. These issues may not be identified in the Request For Proposal, but you as a proposal writer need to tease them out – and then weave these into the fabric of the proposal. Remember that you may be writing for more than one reader. For this reason, keep the text light, focused but not too technical. Avoid using jargon, three letter acronyms, and other buzzwords. You don’t need to break down costs by line item; however, the evaluators will expect to see the total cost required for the project. Don’t try to fudge it and bury the costs in the document. This sends out the wrong message. If you’re confident in your figures, show it in the summary. If you want, you can also discuss the payment structure. For example, state that the client is expected to pay 15% upfront and the balance at different intervals. You need to demonstrate your expertise – but how? It shows that another person (or company) is willing to vouch for you, which reduces anxiety in the reader. It shows that you have a track record in the industry and aren’t another ‘fly by night’ company. You can also look for ways to highlight your qualifications, industry recognition, and other prestigious projects you’ve worked on. Social proof is very important. There are different schools of thought on this. I prefer to keep it to one page. In this way, if it’s printed out, the reader doesn’t have to keep the pages together. They can scan it and absorb the key points in one go. Whereas, when you add a second page, you break the momentum. You don’t want them flicking back and forth checking what you’ve said. Remember to use a large, easy to read font. Don’t make the decision-maker strain to read your text. The may not have the same excellent eye-sight you possess. The last step is the hardest – proofreading. Try to avoid proofing your own document. Instead, ask a colleague to check it for you. If this is not possible, take a look at these twenty proofreading guidelines. The key to effective proofreading is to assume there are mistakes. Check facts, dates, figures and numbers. Print it out and read the document from the End to the Start. This technique forces you to pay attention; you can’t get into a momentum. Another tactic is to read the Executive Summary aloud and check if the tone sounds right. Writing an Executive Summary takes dedication. Instead of writing it first to get out of the way – so you can get into the real document – see it as a separate piece of work. Identify the core messages you want to convey, emotional triggers you want to evoke, and create a sense of urgency. 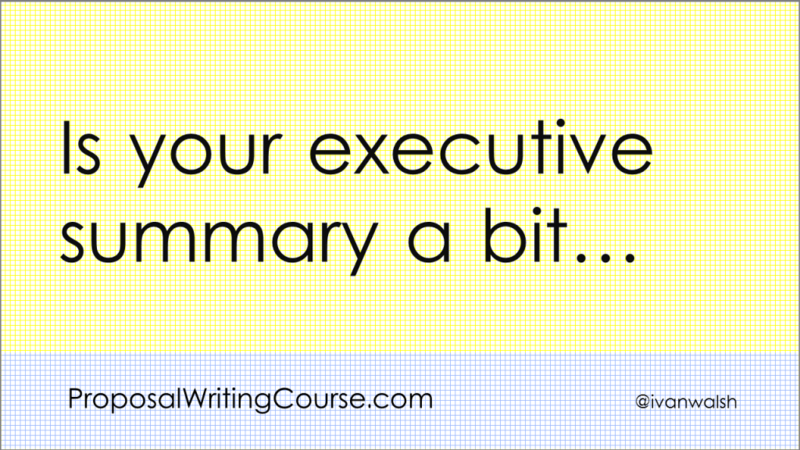 How do you write Executive Summaries? Do you write them before or after the proposal?